In the spring of 1946, following the defeat of Hitler’s Germany, America found itself still struggling with the subtler but no less insidious tyrannies of racism and segregation at home. In the midst of it all, Jackie Robinson, a full year away from breaking major league baseball’s color barrier with the Brooklyn Dodgers, was undergoing a harrowing dress rehearsal for integration—his first spring training as a minor league prospect with the Montreal Royals, Brooklyn’s AAA team. In Blackout, Chris Lamb tells what happened during these six weeks in segregated Florida—six weeks that would become a critical juncture for the national pastime and for an American society on the threshold of a civil rights revolution. 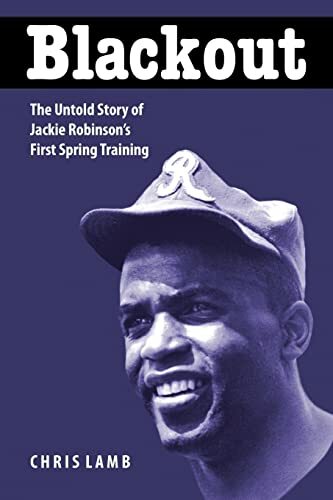 Blackout chronicles Robinson’s tremendous ordeal during that crucial spring training—how he struggled on the field and off. The restaurants and hotels that welcomed his white teammates were closed to him, and in one city after another he was prohibited from taking the field. Steeping his story in its complex cultural context, Lamb describes Robinson’s determination and anxiety, the reaction of the black and white communities to his appearance, and the unique and influential role of the press—mainstream reporting, the alternative black weeklies, and the Communist Daily Worker—in the integration of baseball. Told here in detail for the first time, this story brilliantly encapsulates the larger history of a man, a sport, and a nation on the verge of great and enduring change. 9. Blackout: The Untold Story Of Jackie Robinson's First Spring Training.